A domain name is a unique address that can be used on the Internet. It's what you see in the address bar after the "www." in your web browser and it's what comes after the @ sign in an email address. Domain names consist of two parts. For example, in "goyacom.in" the ".in" represents what is known as the top level domain (TLD) and "goyacom" represents the second level domain and is the actual name. 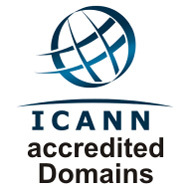 The same name, which can be up to 63 characters long, can be used with different TLDs, such as .com, .org and .net, etc There are also country specific Top Level Domains, such as .in for India. When a domain name is used in a web address, "www" is usually put in front of it to indicate that typing that name into your web browser will take you to a website. Domain name holders can set up a website with that address and also use it for email addresses. When you are a domain name holder you get to decide what is in front of the @-sign in the email address.